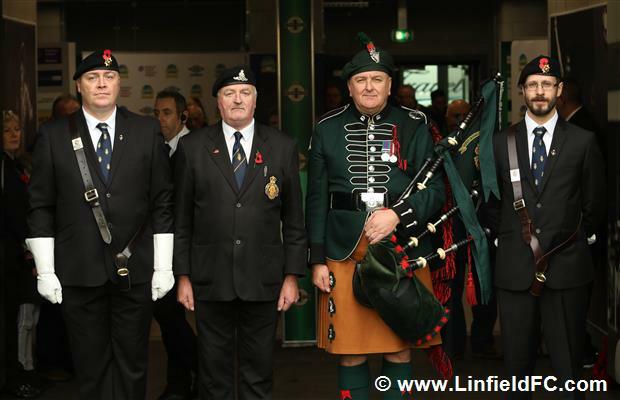 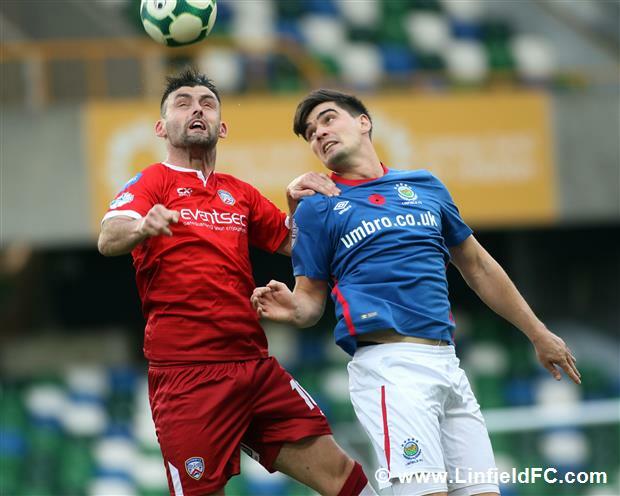 A late fightback wasn’t enough for Linfield as they were defeated by Rodney McAree’s Coleraine at Windsor Park this afternoon. 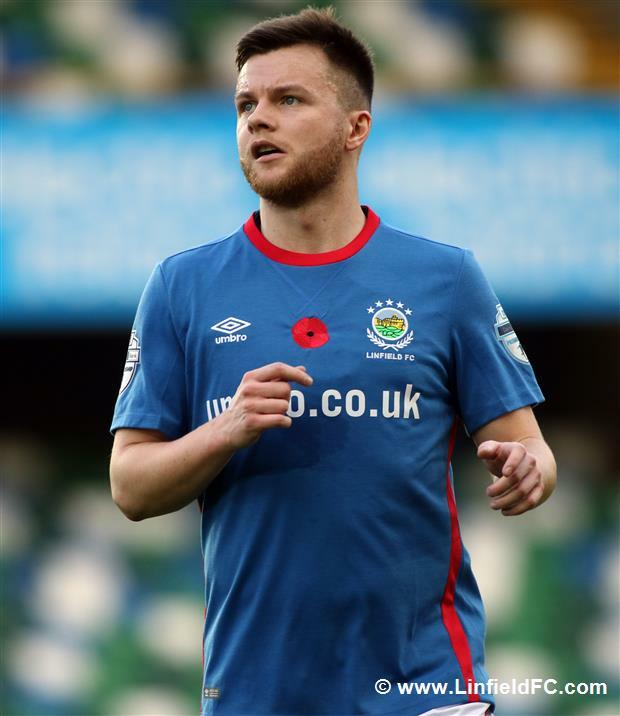 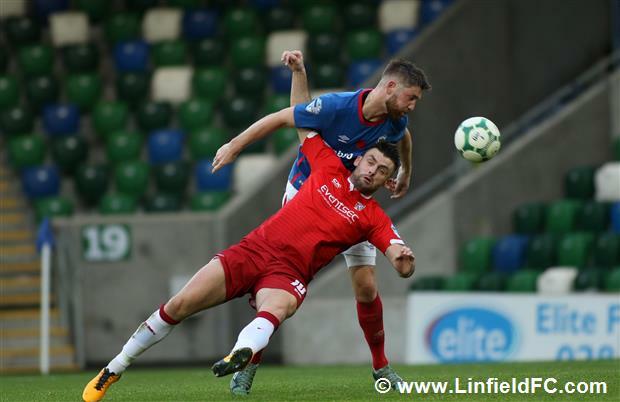 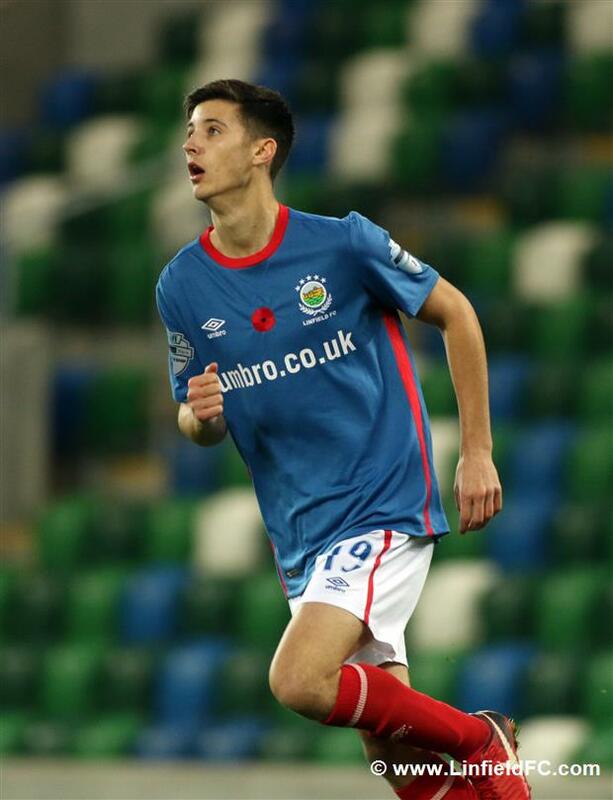 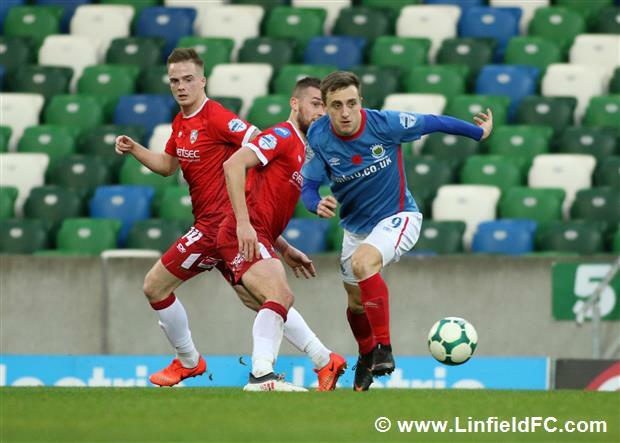 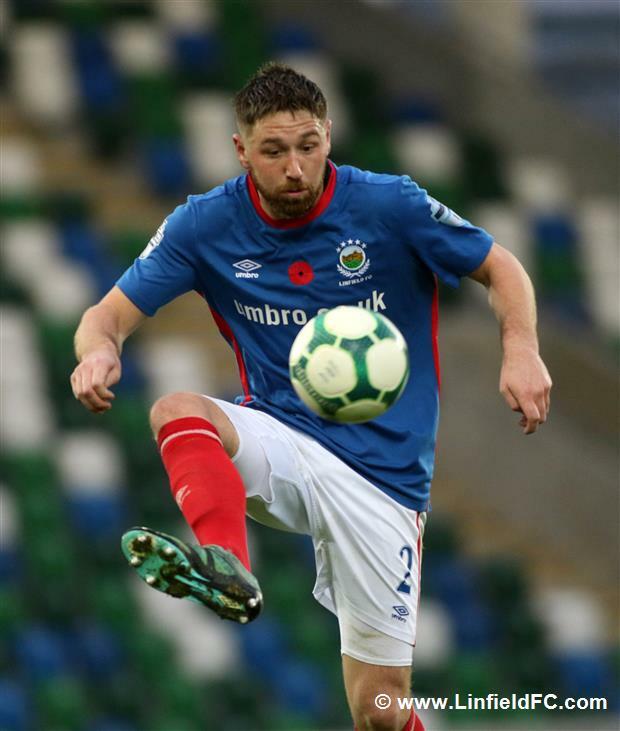 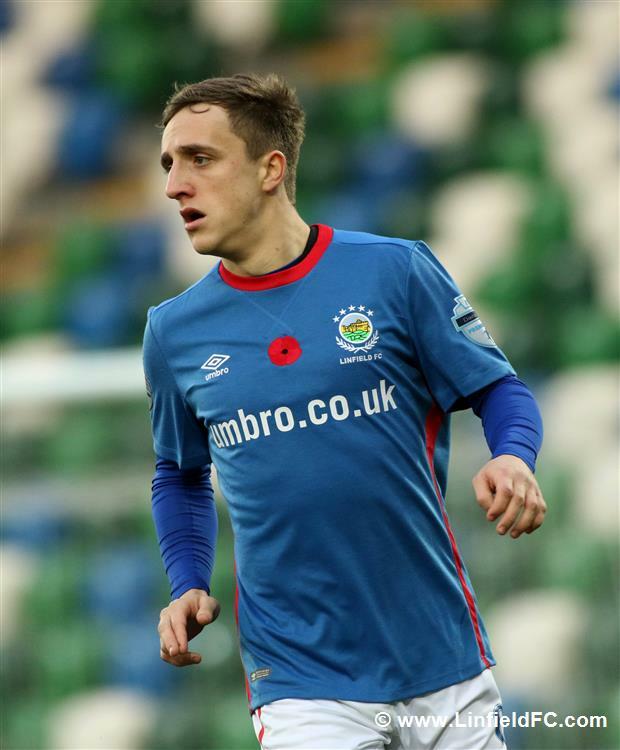 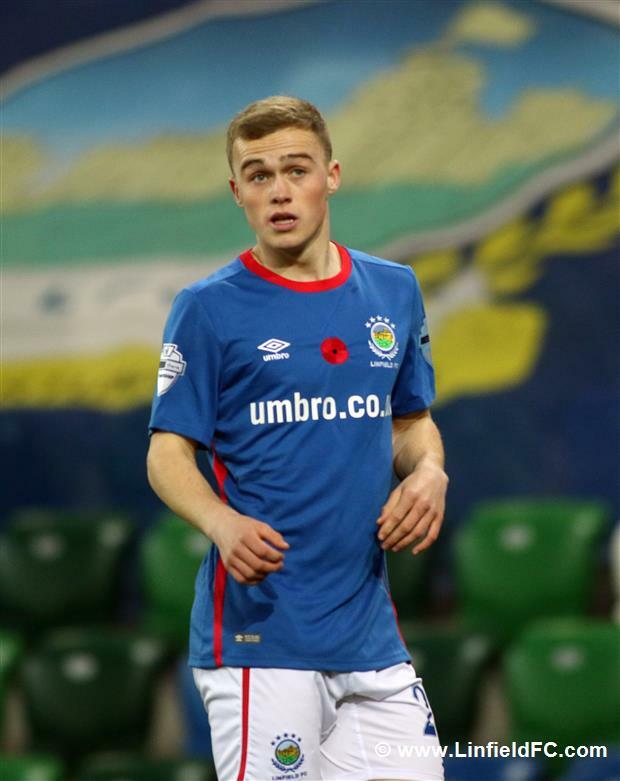 Michael O’Connor missed out for Linfield through suspension after picking up his fifth booking of the season against Warrenpoint last week, meaning a start for Jordan Stewart following some impressive performances off the bench in recent weeks. 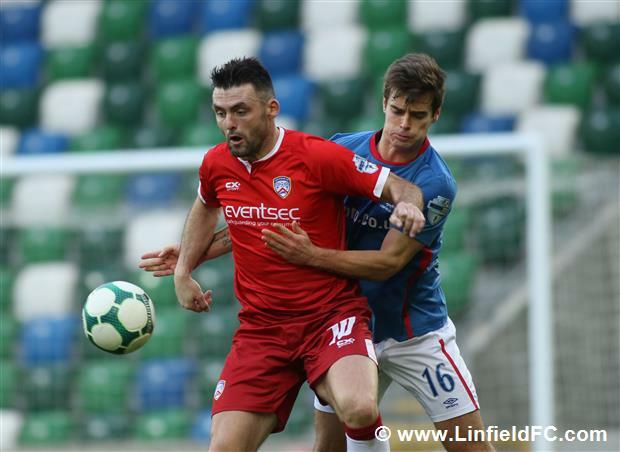 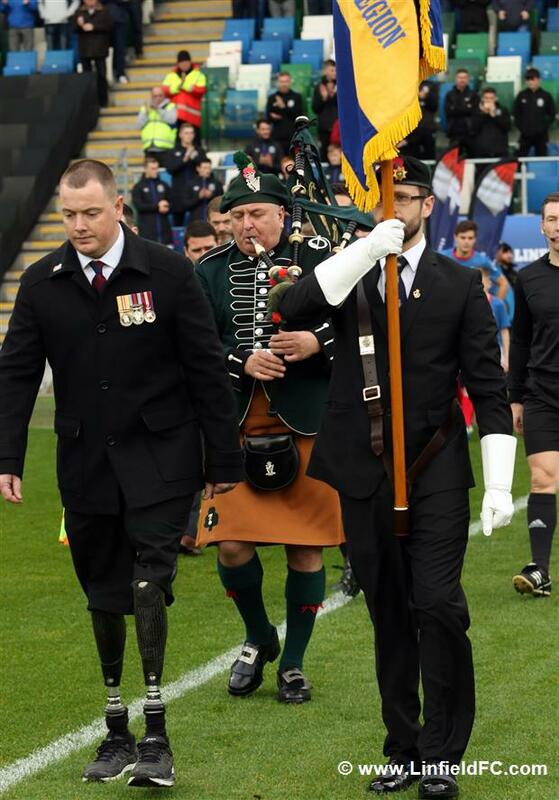 Chris Casement returned from injury. 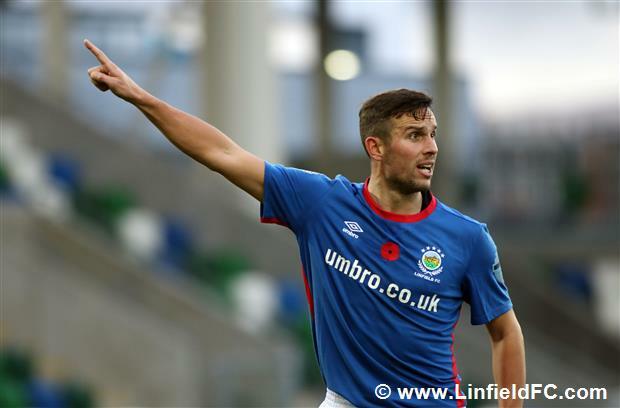 Linfield started the game brightly with Jimmy Callacher heading just wide from a free-kick and Jordan Stewart threatening, but the ball just ran away from the impressive number ten just as he looked through on goal following a neat threaded pass from Kirk Millar. 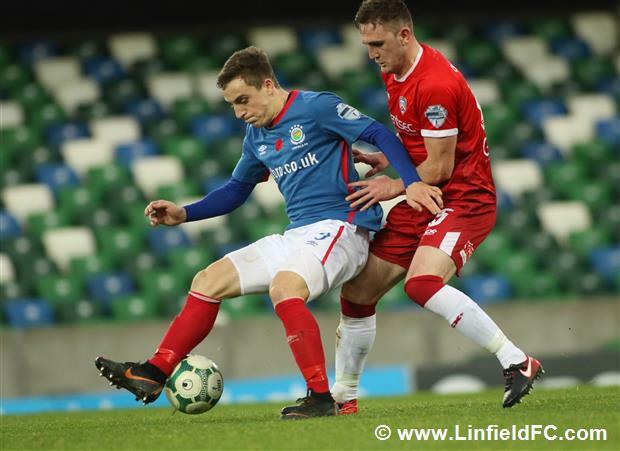 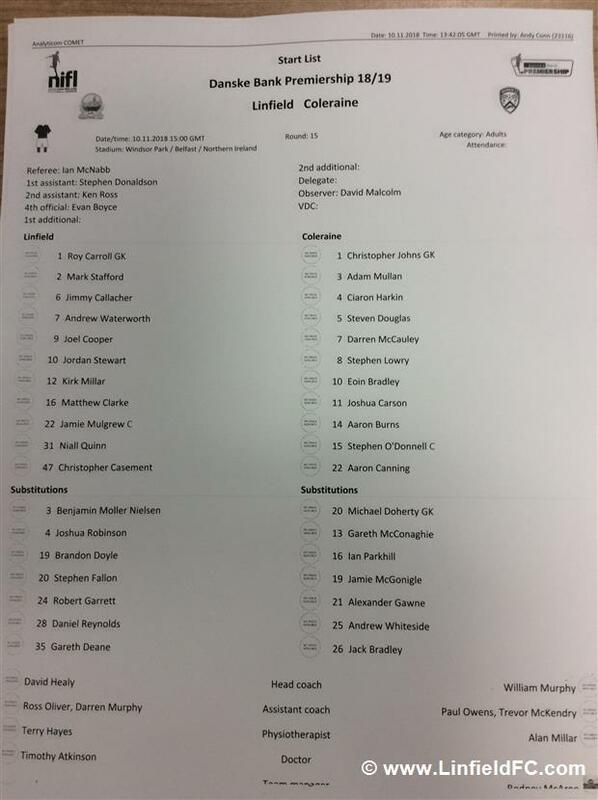 Coleraine had a good chance on 11 minutes when Ciaron Harkin’s cross fell for Aaron Burns with a bit of fortune, but the former Linfield man fluffed his lines from close range on his weaker right foot. 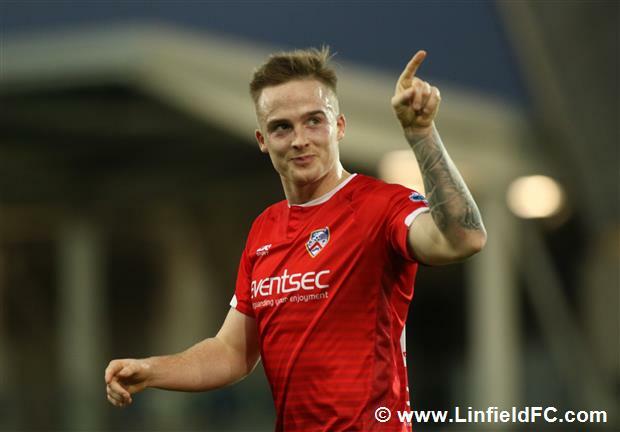 Minutes later, the Bannsiders went even closer to scoring when Eoin Bradley fired a shot into the side netting from Josh Carson’s cutback – so close that the travelling support thought it was in. 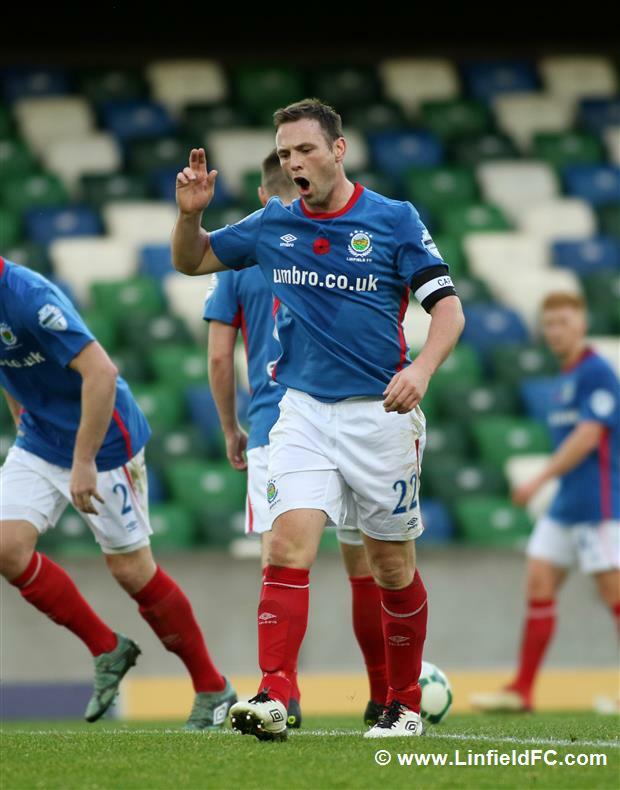 The opening goal did come for Rodney McAree’s team on 21 minutes, however. 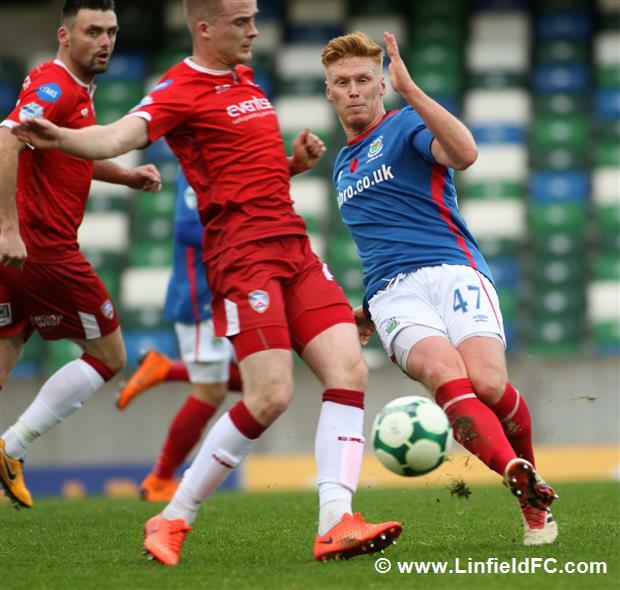 Darren McCauley picked the ball up on halfway and dribbled his way through before firing a driven shot, low towards goal and it deflected off unfortunate Linfield defender Matthew Clarke and into the corner. 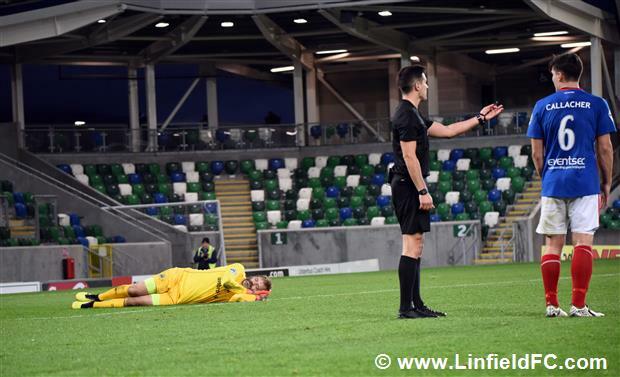 Coleraine winger McCauley very nearly replicated his opening goal on 35 minutes, only for a top save from Roy Carroll to get down low with an outstretched arm to keep it out. 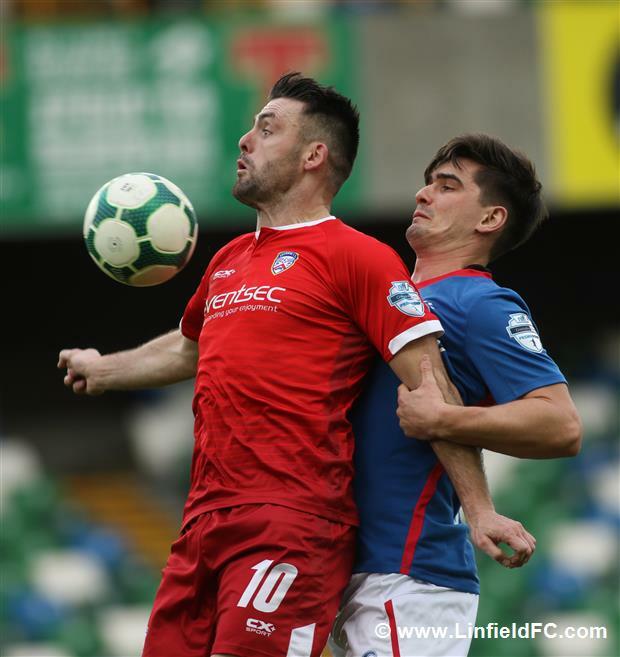 The Blues struggled to cope with the winger throughout the first half. 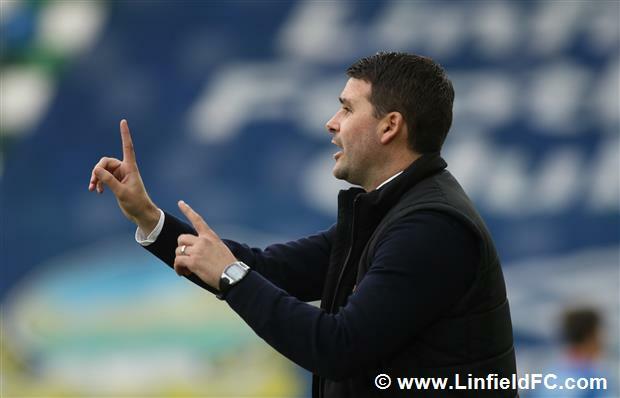 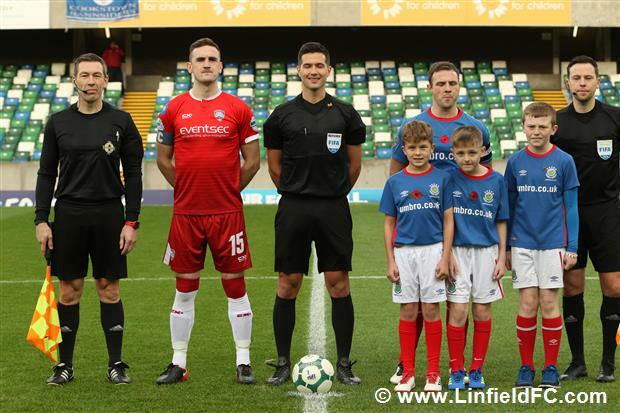 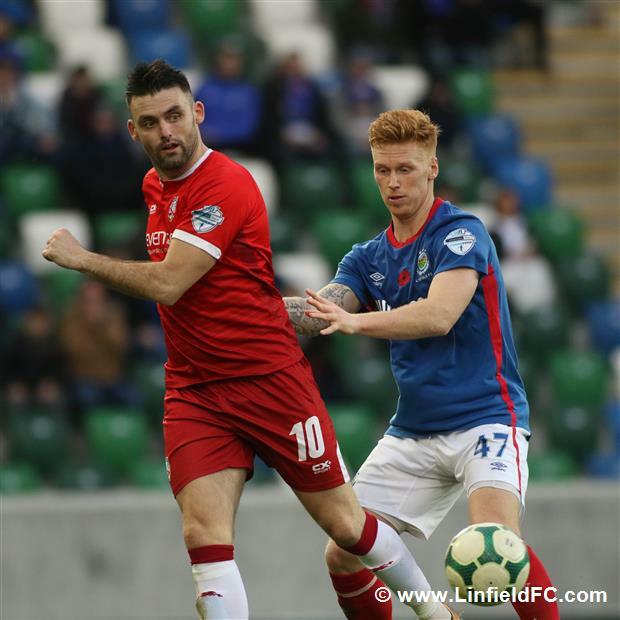 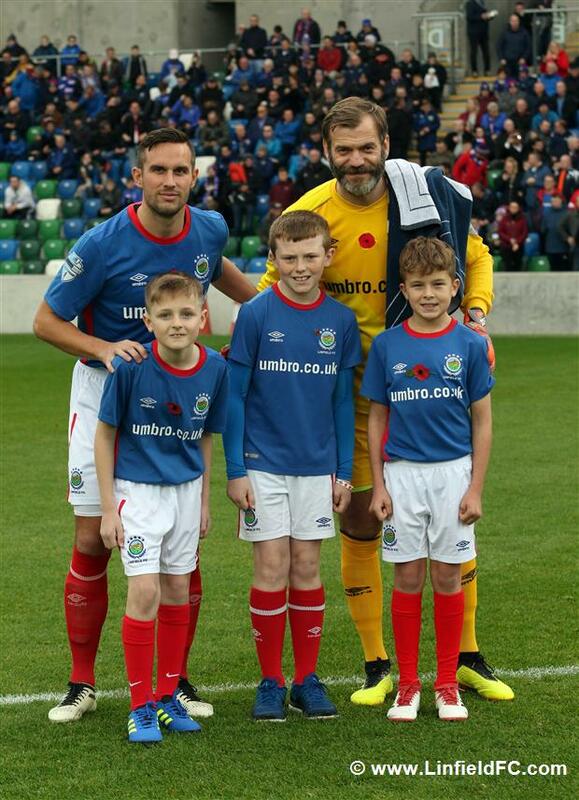 The start of the second half saw Linfield show a bit more intent but again it was Coleraine who went close on 53 minutes when Stephen Lowry threaded a pass to Eoin Bradley who turned his marker and fired at goal with Roy Carroll beating the effort away for a corner. 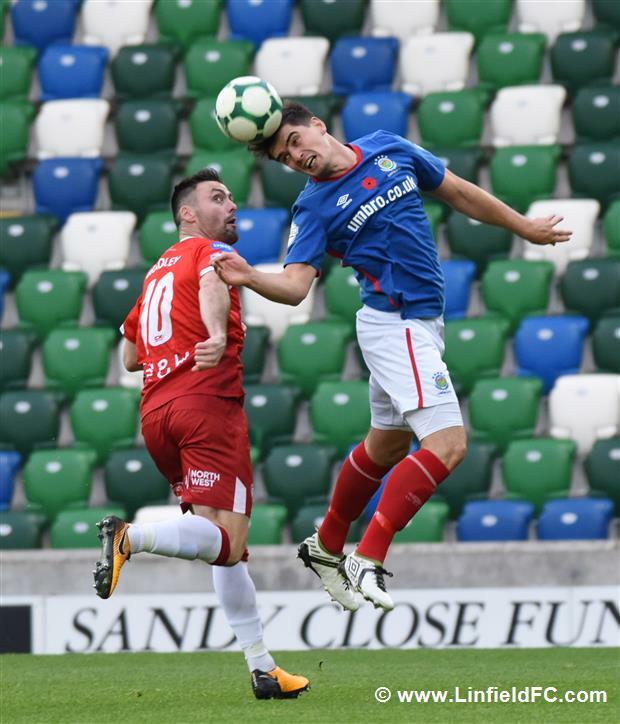 The Bannsiders kept knocking on the door and worked an opening well with the ball ultimately finding Jamie McGonigle at the back post but he fired high and wide, a big chance wasted. 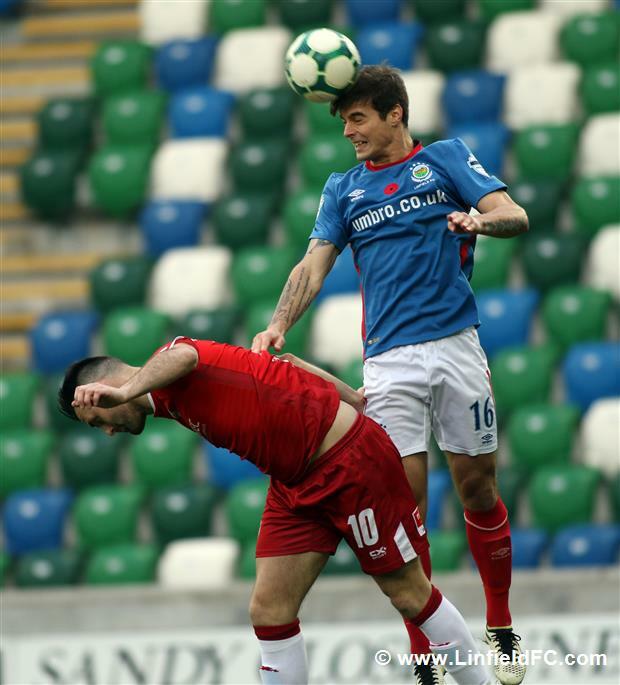 Just moments after Joel Cooper had a goalward strike blocked, Coleraine countered and added a second goal. 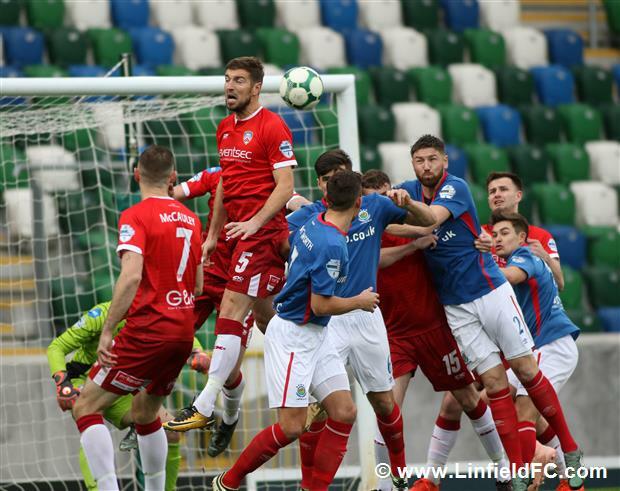 The visitors worked the ball out the right and McGonigle fired in a low cross which had to be dealt with and, unfortunately Kirk Millar turned it into his own net in an attempt to clear. 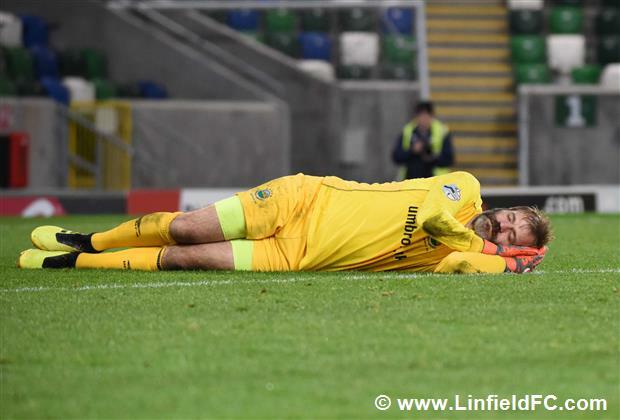 Controversy arose on 73 minutes when Stephen Lowry attempted a backpass to his goalkeeper, only for Waterworth to be lurking. 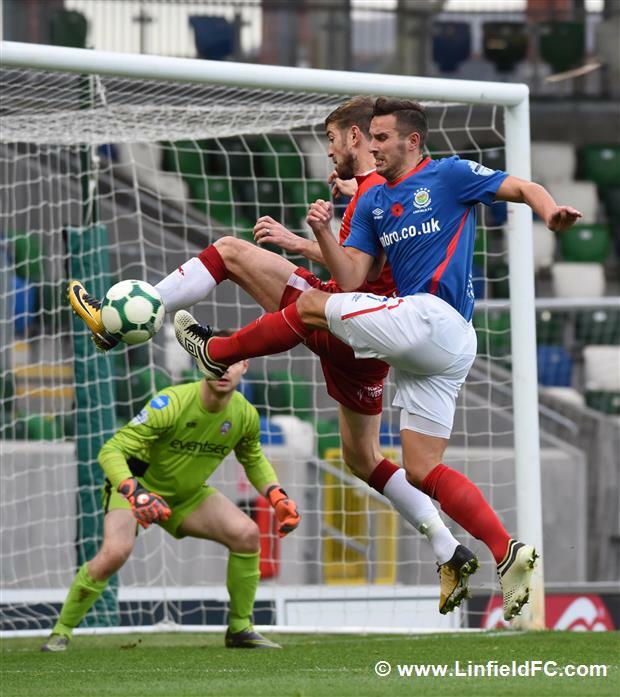 The striker got there ahead of the goalkeeper who brought him down but no foul was given and Waterworth ended up being booked for an unknown reason. 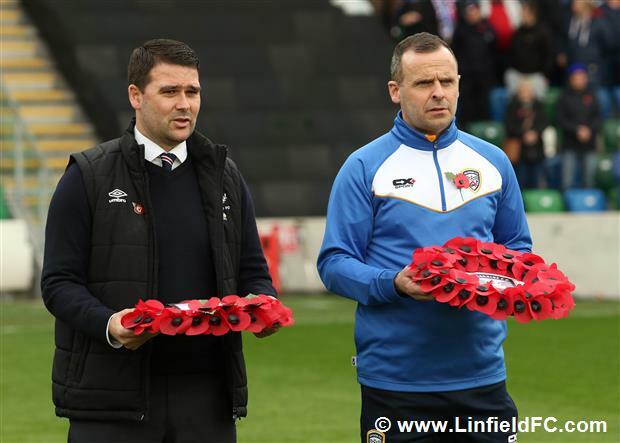 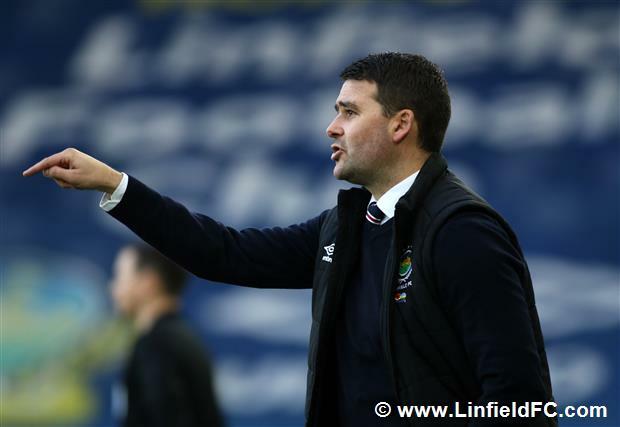 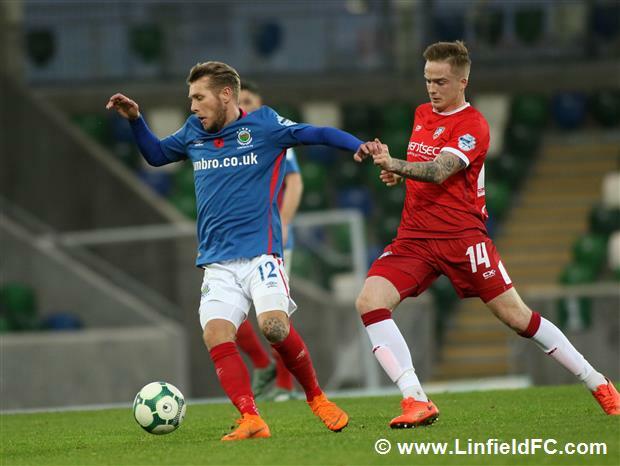 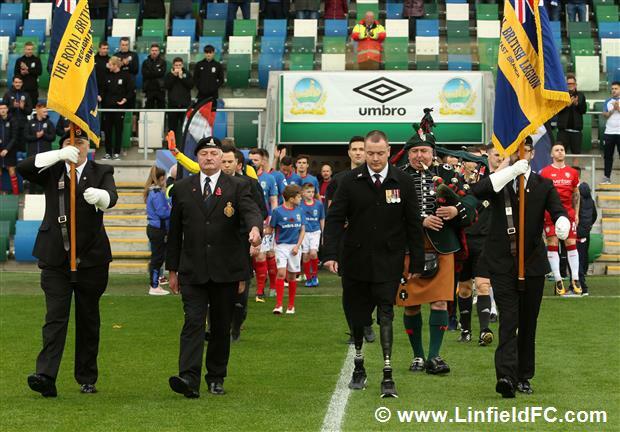 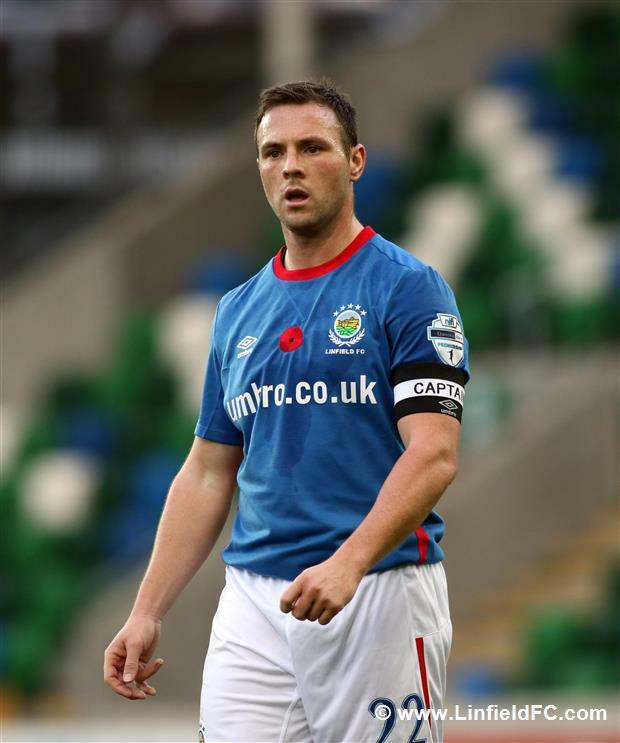 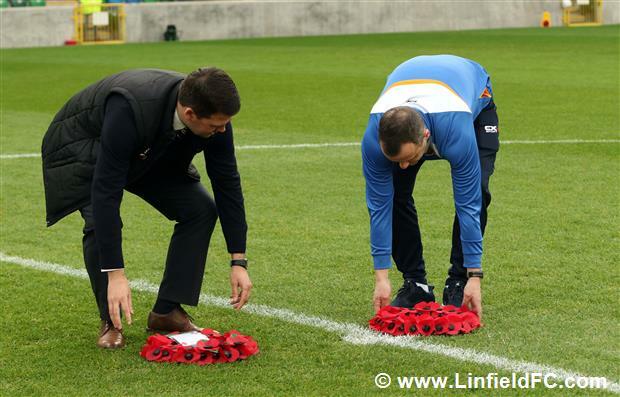 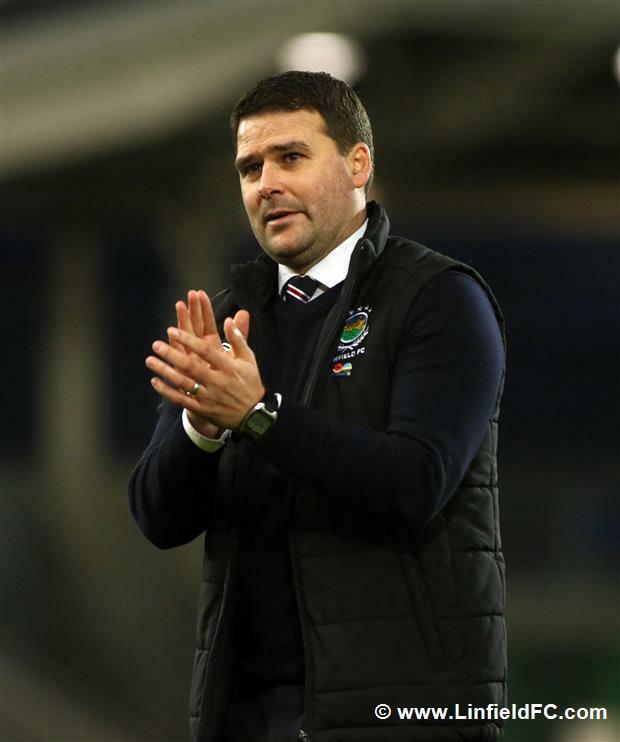 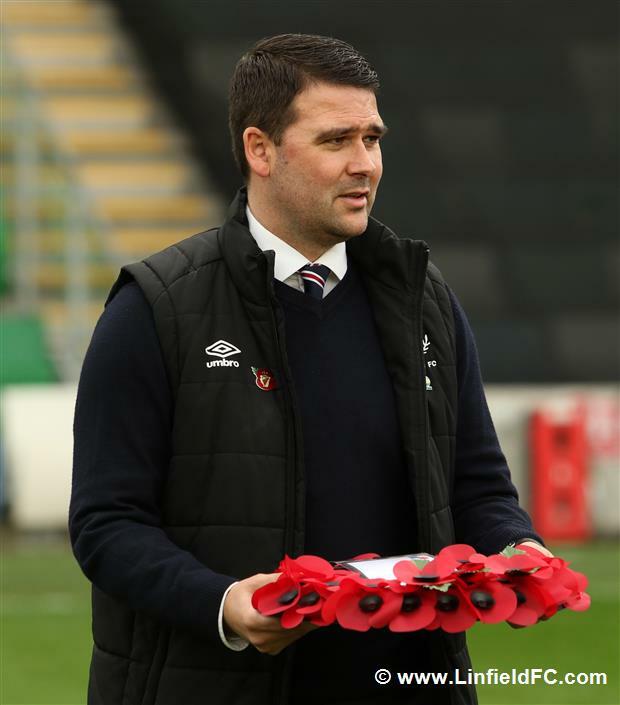 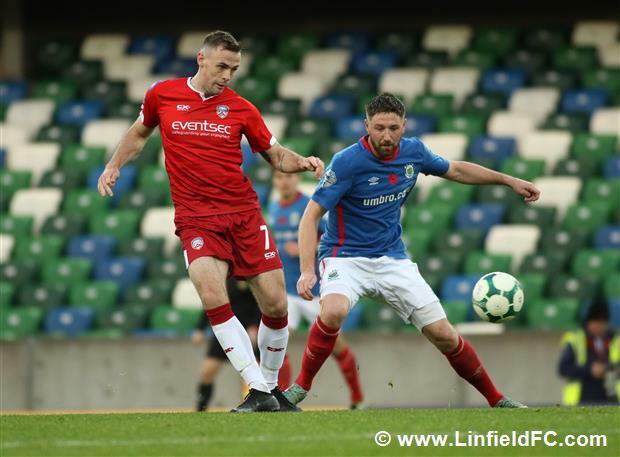 Linfield pulled one back on 86 minutes when Kirk Millar’s corner was forced in after a series of deflections with the scorer unconfirmed – quite possible that it was an own goal, although it may have hit Stafford at the back post. 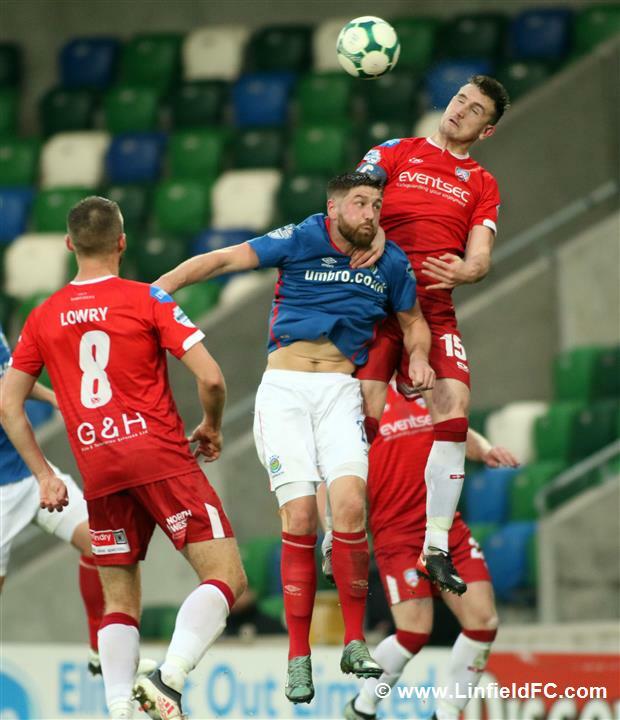 Just a minute later, the Blues almost drew a miraculous leveller when debutant Brandon Doyle picked up the ball in the box before arrowing a low strike at goal, but Coleraine goalkeeper Chris Johns produced a great diving save.